Well, that was almost a nice series win to start the season. Instead, the Yankees were not able to hold on to a 4-1 lead and melted down to a 7-4 loss Sunday. Sonny Gray labored through four innings and Chad Green was the only reliever not to allow runs. Both Tommy Kahnle and David Robertson allowed big homers to Justin Smoak to let it slip. There’s the first L of the season that we won’t be forgetting anytime soon. Both starting pitchers had a knack for stacking up baserunners in the first couple innings. Marcus Stroman walked Aaron Judge and Giancarlo Stanton in the first, but got out of the frame with strikeouts to Didi Gregorius and Neil Walker. Gray walked Devon Travis and allowed a single to Josh Donaldson to start his game but struck out Justin Smoak, Yangervis Solarte and Curtis Granderson to get out of it. Thank God for Judge’s assist to throw Russell Martin out. The inning could have gotten out of hand without that extra out. It’s also ridiculous how easy he made it look. He launched a cannon from the right field and Martin wasn’t so close to being safe. The Yankees took the first commanding lead in the third. Stroman struck out Brett Gardner and Judge to start the frame. Stanton worked a walk and Gregorius doubled to deep center to drive him in. 1-1 tie game. 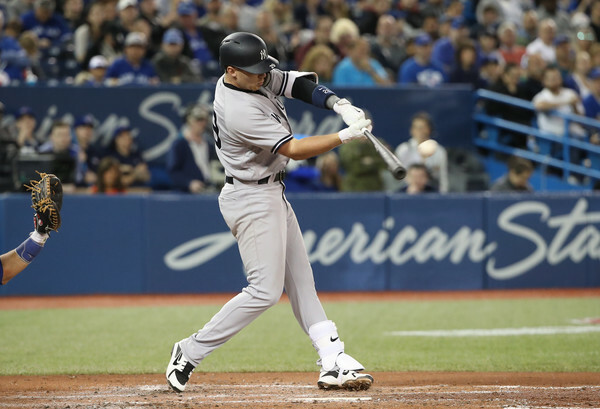 Walker singled to give Yankees a lead and Brandon Drury followed it up with a two-run home run to make it 4-1. With Sonny Gray not looking bad and the Yankees bullpen waiting, a lot of us had good feeling about this game to this point, right? Well, that’s why you play the game. Anything can happen in baseball, especially when your starting pitcher goes only for 4.0 innings pitched. Gray had his ups and downs in this start. A 4 IP, 1 run outing isn’t bad. You want your starting pitchers to go for 5 or 6 innings though. After allowing a bloop single to Justin Smoak in the fifth, he was at 89 pitches (also stacked up 10 baserunners) and that was simply too many for the first start of the season. On a plus side, he missed a decent amount of bats. Gray got 16 whiffs on 89 pitches, with 10 coming from curveball. When he’s on and locating, Gray is as nasty as any starter could get. The Blue Jays lineup, however, isn’t exactly a walk in the park. They made him work to the extent that Boone reached to his bullpen with no outs in the fifth. Green came out of the pen in the fifth and well, he was Chad Green. He struck out four in two scoreless innings to hold a 4-1 lead into the seventh. In a perfect pinstriped world, the Yankees would have used Kahnle – Robertson – Aroldis Chapman sequence to close out the game. Kahnle did not get off to the best start in the seventh. 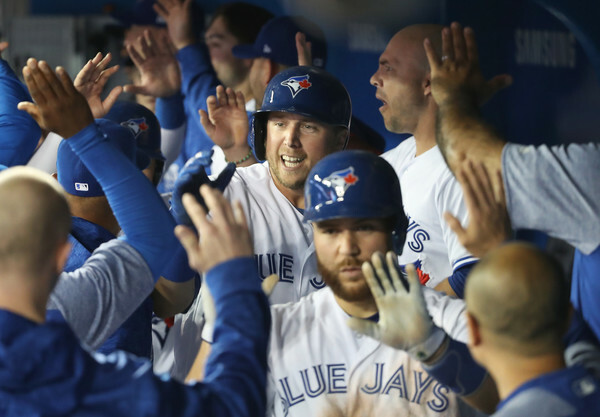 He walked Donaldson and gave up a two-run, 420 feet dinger to Smoak to make it a one-run game. He got the next two batters and Boone called on Robertson to build a bridge to Chappy. He got out of the seventh with a one-pitch out from Grichuk. And then the eighth inning happened. Robertson gave up a lead-off single to old friend Russell Martin. After Kevin Pillar lined out, Aledmys Diaz hit a double to right-center to put two runners in scoring position, uh-oh. Robertson induced a Devon Travis grounder to himself to make it two outs, making the situation much more palatable. With Josh Donaldson (3-for-8 with 2 HRs vs. Robertson) coming up, the Yankees opted to intentionally walk him and face Justin Smoak (0-for-5 with 4 K’s vs. Robertson). The outcome of this at-bat was going to set some kind of narrative for the early part of Aaron Boone’s managerial career since it is a quite interesting call on a super dicey situation… and it did not go well. Robertson faced a dangerous LHH instead of a dangerous RHH. One could make an argument that Robertson dominated Smoak in the past, but in the YES booth, David Cone wasn’t having it, noting that five at-bat sample isn’t big enough to take that risk against a hot hitter in Justin Smoak. Also, Smoak isn’t the same hitter that he was in the earlier in career. After a nine-pitch at-bat, Smoak hammered a fastball inside over the wall for a backbreaking grand slam. 7-4 Jays. Welp. It will be interesting to see if this decision will set any kind of precedence for Boone in future decisions. In the postgame, he remarked that Robertson’s breaking ball seemed like a better matchup against Smoak. And, of course, Smoak fouled off a bunch of Robertson’s curveballs before hitting his fastball out of the park. Oh well, you have games like this. Things would have been discussed very differently had Robertson struck out Smoak. But because what happened happened, this is how we are talking about it. The Blue Jays sent one of their FA signees RP Seung-Hwan Oh in the ninth. The Yankees tried threatening with a two-out Judge single, but that’s about all they could muster. Womp womp. All the Yankees’ base hits came from 2, 4, 5 and 6 spot hitters. Judge, Gregorius, Walker and Drury combined for 5-for-15 and the rest went 0-for-19. Drury had the best day of them all: 2-for-3 with a two run homer. Yeah, this game stunk but at least you can feel good about the new starting third baseman. Here’s today’s box score, video highlights, updated standings and WPA.